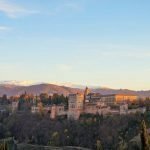 From pristine powdery sand beaches, metropolis cities, picturesque mountain landscapes and charming towns, this country is home to a wealth of different attractions for everyone. Due to its long and stretched shape it also is a country that allows a good planning for a solid itinerary. Many travelers chose to either do the north to south or south to north route – either one, there is only one way to be heading! We arrived in the South and continued our journey all the way up. 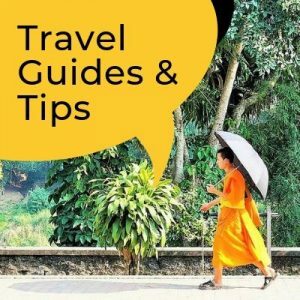 This is our suggested Vietnam itinerary and travel for a 3 weeks throughout the country (our recommended minimum length of stay). 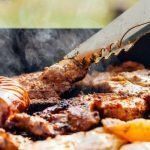 The best time to travel Vietnam is probably around October or December as this allows some decent weather both in the south and the north. Alternatively March and April are also good months to travel the entire country. 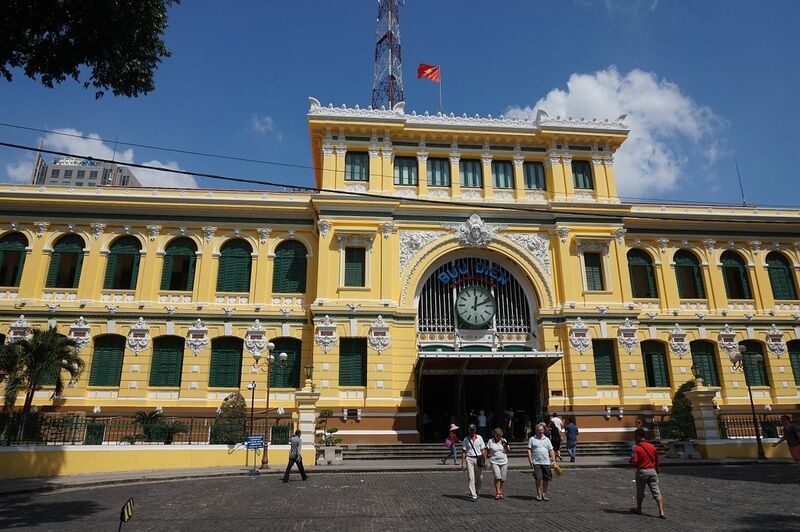 A great Vietnam itinerary would start in Ho Chi Minh which is Vietnam’s largest and most vibrant city. 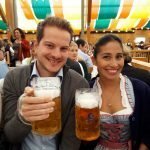 It is picked with lots of museums, Pagodas, shopping malls, great offers of budget and luxury hotels and a delicious food scene. 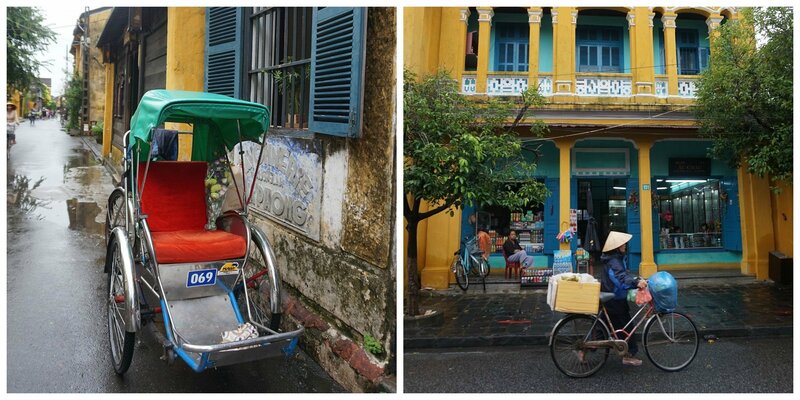 The architecture is a mix of French colonial style buildings and modern constructions. 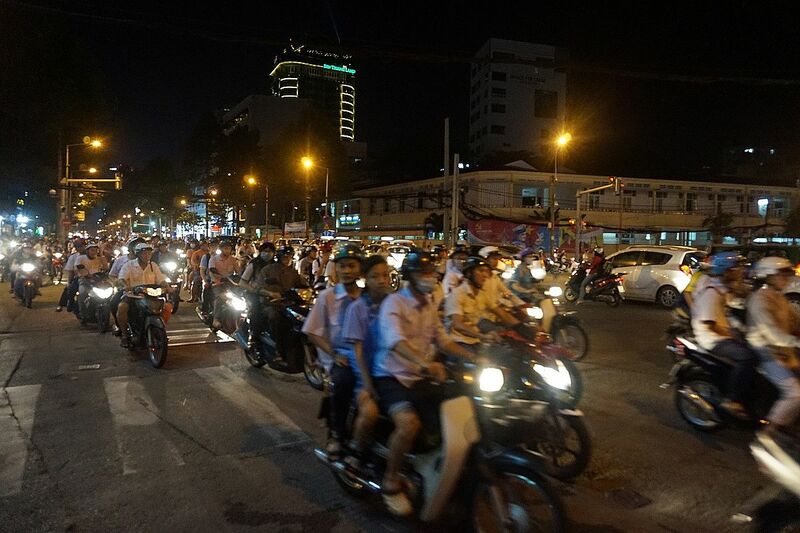 The city is absolutely packed with motorcycles, as this is the main way of transport for most Vietnamese people. Be aware as crossing the streets here as it can be quite an adventure! 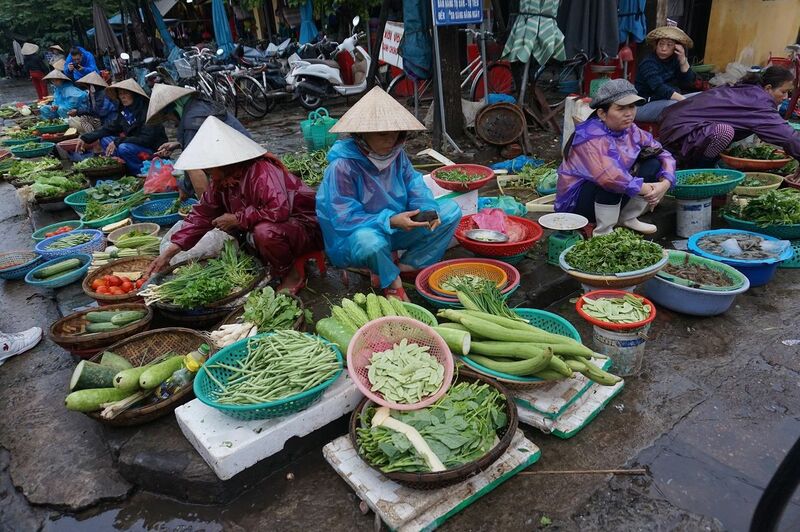 See our post on 12 Things you did not know about Vietnam and read about our experiences here. 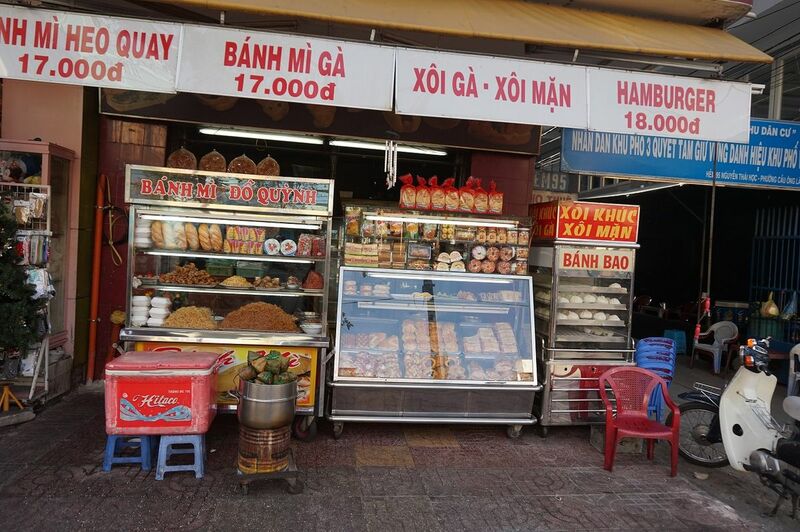 We had some great food in town – the soups are delicious, especially the classic Pho and Bun Bo. 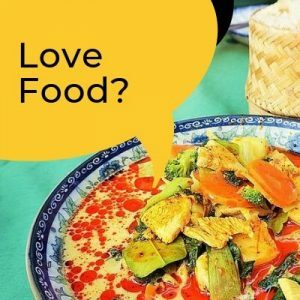 Take a stroll through town and discover the busy side streets filled with restaurants, shops, bars and small vendors selling street food. Special landmarks are the Notre Dame Cathedral, the Post Office and the Reunification Palace. 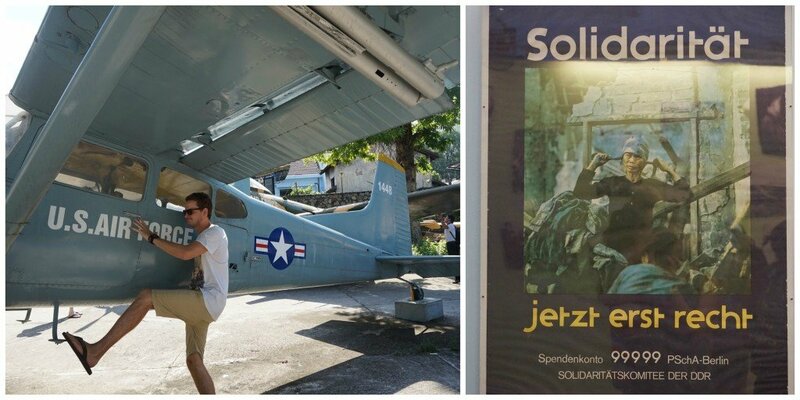 We also visited the War Remnants Museum as it is essential to know about the countries past in order to understand its present. Also, enjoy some spectacular views from one of the many roof-top bars. Spending around 2 days here should be sufficient as there are more exciting destinations to visit. Just your everyday Ho Chi Minh City motorbike madness! 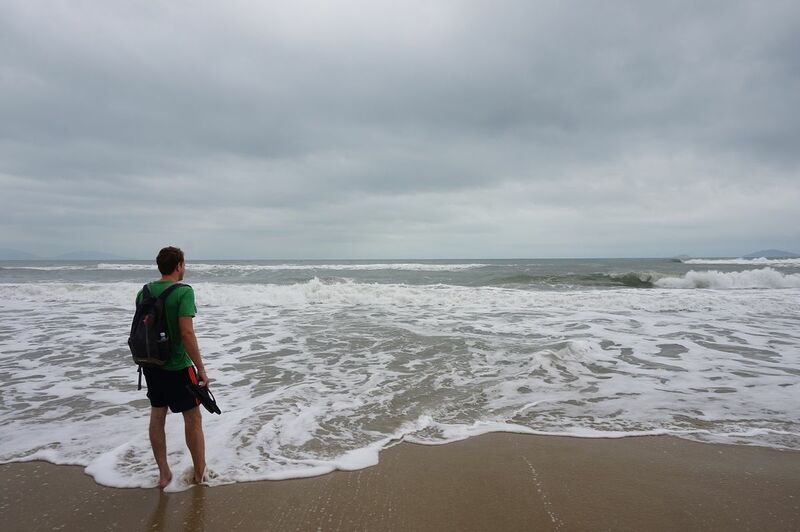 Take a rough 4-hour bus ride up north and discover the beach town of Mui Ne. With a 12 kilometer bay filled with lots of accommodation options it is an attractive destination for many travelers seeking for a nice beach time away from the bustle of the city. 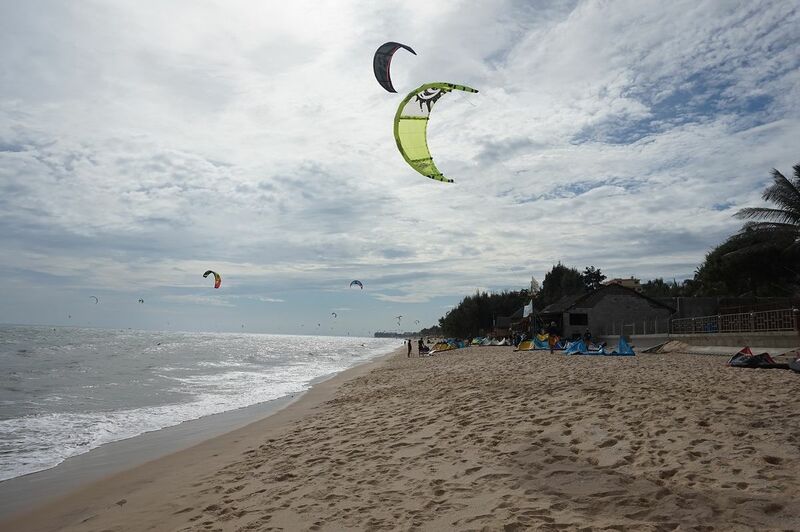 The beach as such is not the best for swimming but is more famous for its kite surfing. 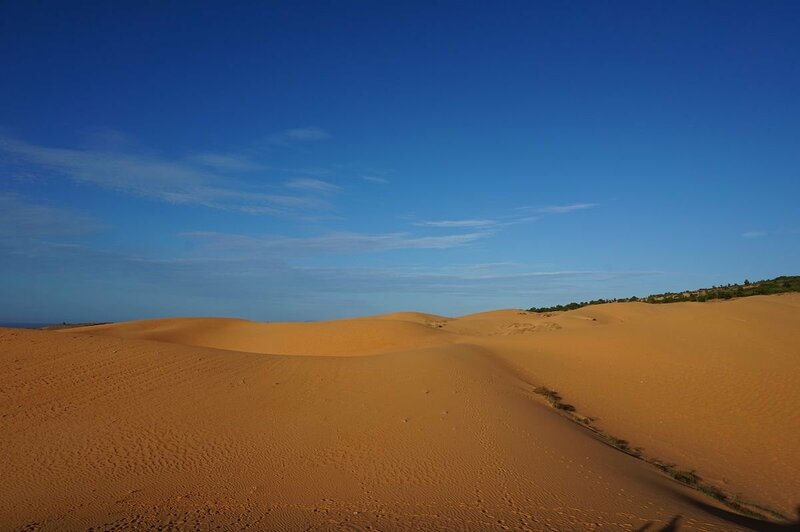 A bit outside of town you can find some amazing sand dunes and creeks. Spend around 2 days here and continue further up north, this time heading into the central highlands for a complete change of scenery. 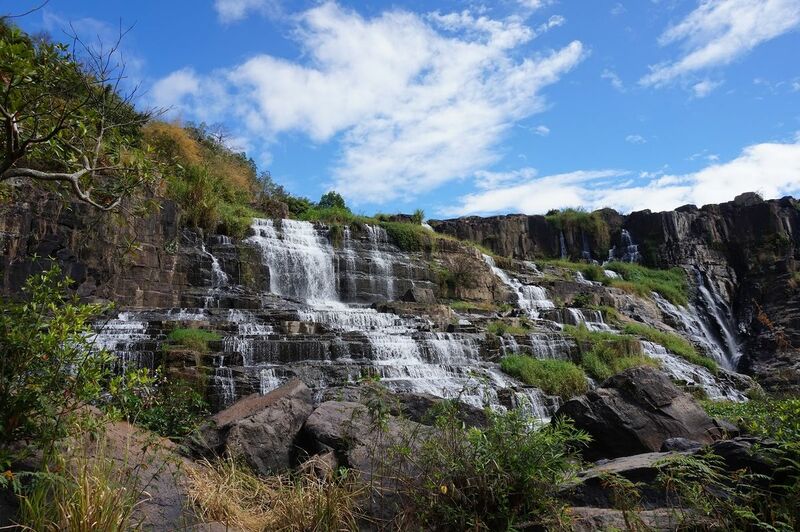 Da Lat will offer you a complete change in terms of what you have seen so far. 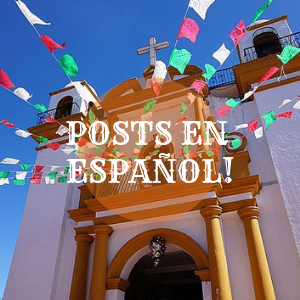 Located roughly 1,500 meters above sea level you will find a more temperate climate here. The air is fresh and it gets quite cool at night – a perfect way to escape the lowland heat. Spend roughly 2-3 days here, take an easy-rider tour and enjoy the natural beauty of this area. 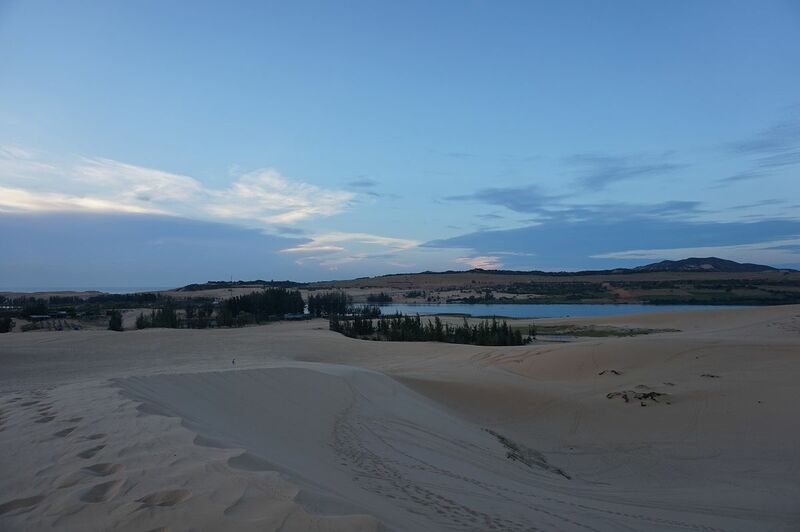 Read more about what you can do in Mui Ne and Da Lat in our other blog post. Ready for some easy rider action! 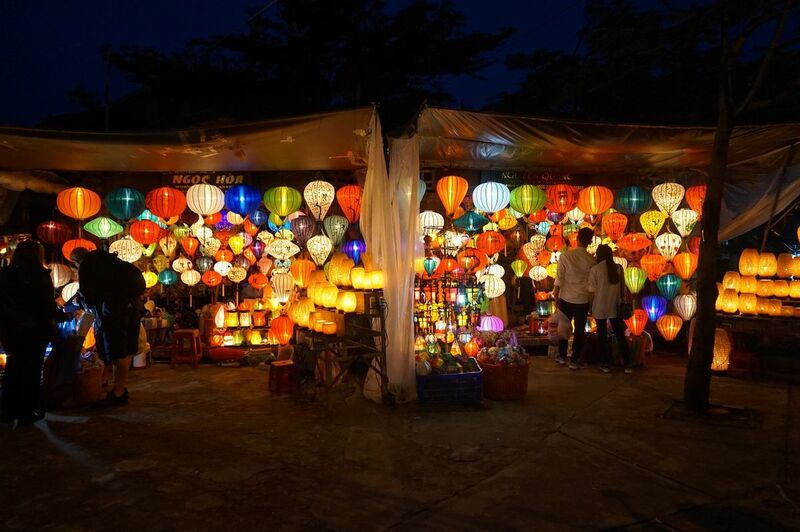 We decided to take a long, overnight bus ride to the city of Hoi An. On the way you can chose to stay in some other beach locations such as Na Trang or Doc Let but we didn’t end up going there and actually just used Na Trang as a town to change buses. From what we have heard the city is packed with loads of Russian tourists, so its really up to you to stay or not. 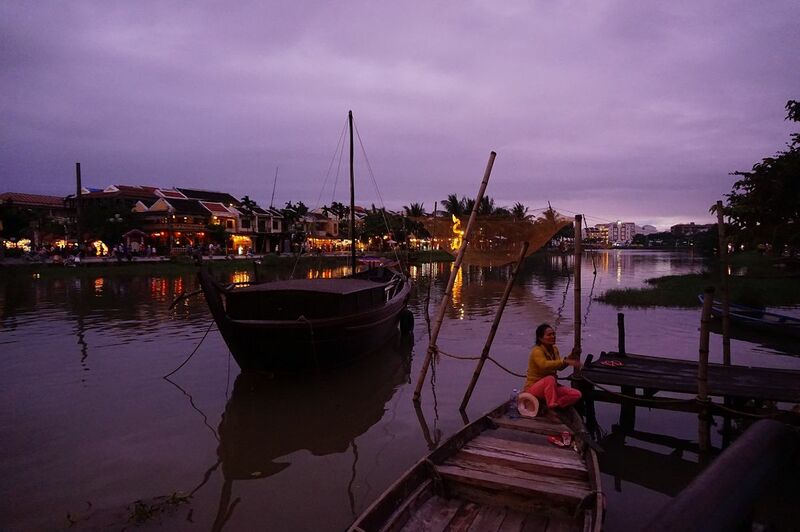 Hoi An turned out to be one of our favorite destinations during our trip. 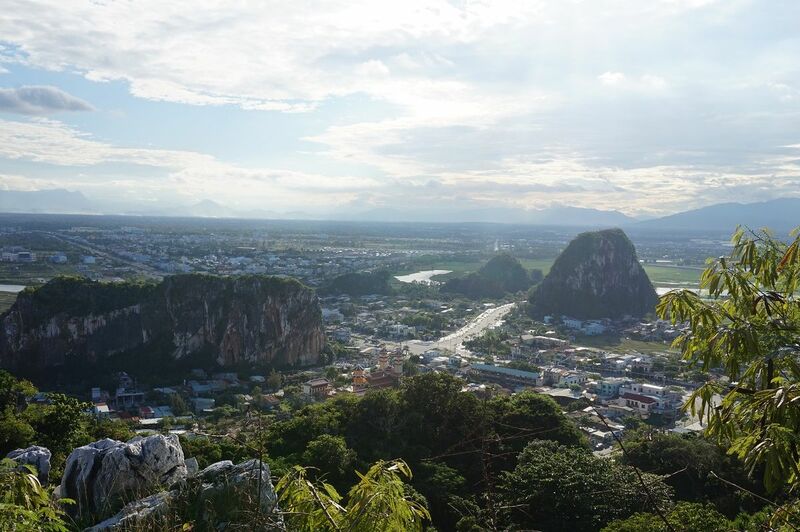 The town really is a classic Vietnamese river town and is listed as a UNESCO World Heritage site. Being so, the town obviously is firmly positioned in every tourist guide and can be packed with loads of foreign, especially Chinese, tourists. 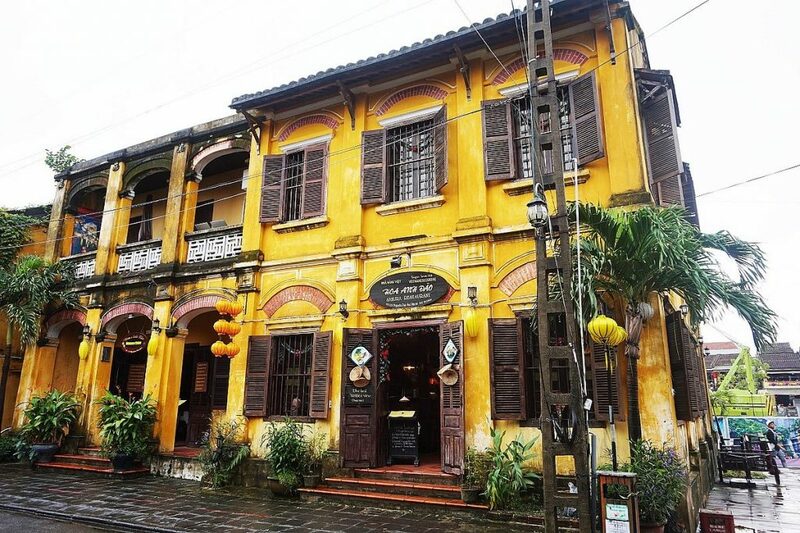 Yet, we absolutely enjoyed the picturesque setting of yellow houses draped with flowers and silk lanterns and loved to walk through the small side streets of the old town. Also, you can take a bicycle and cruise around town and its beautiful surrounding areas and even find a beach not far away. There are many temples along the way, the food is great and you can find loads of shops offering you custom-made clothing and shoes for a decent price. The mix of all these things made this town a simply great place to stay. 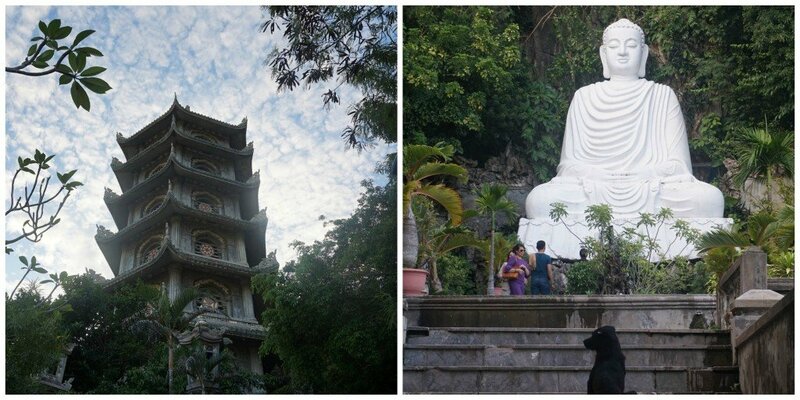 We took a local bus and headed up to the next town of Da Nang. 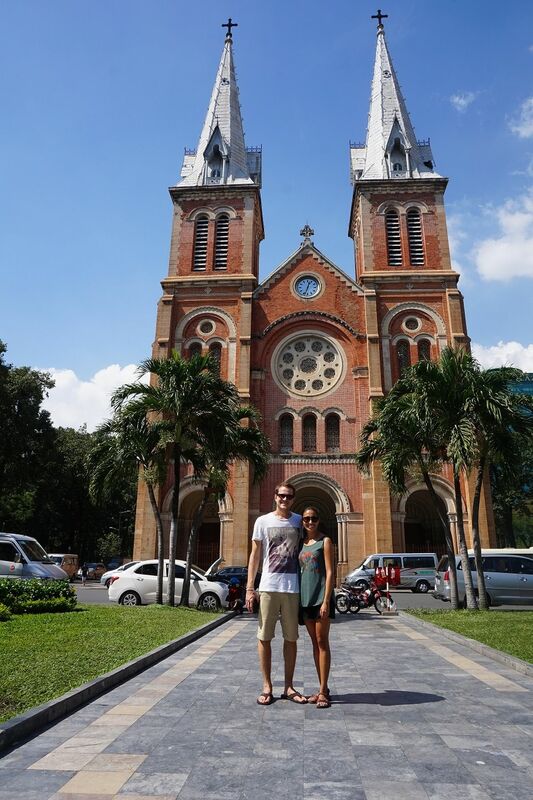 The city is quite large and hosts an international airport – which we eventually used to fly further up to Hanoi. 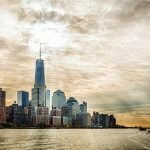 The city as such does not have too much to offer but is a lively proof of how fast the country’s economy is developing. 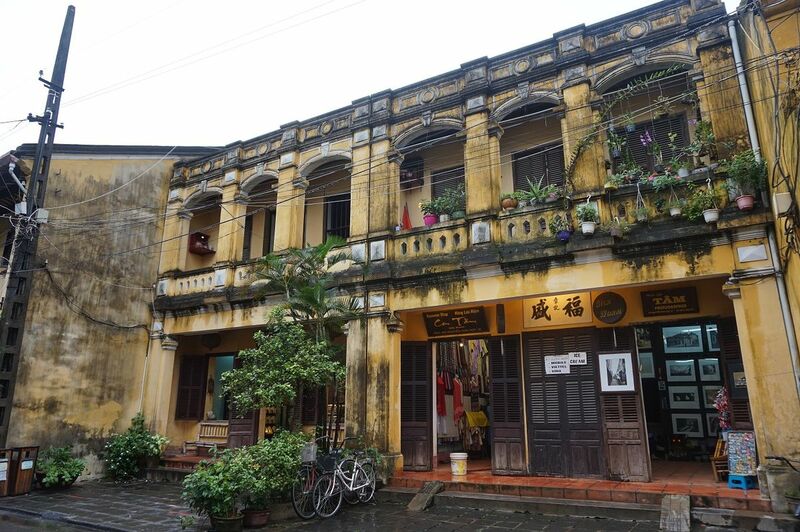 Constructions can be found everywhere as there is a huge waterfront stretch that is currently rebuild to accommodate the growing number of tourists arriving for the popular destination of nearby Hoi An. 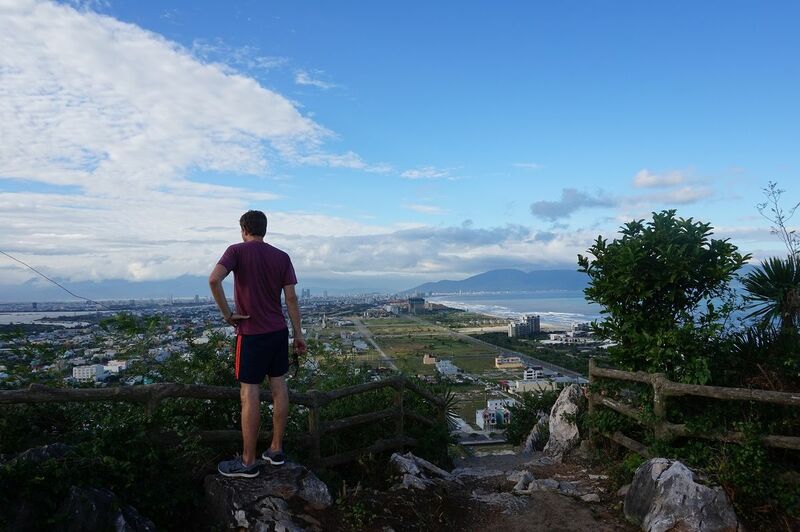 Nevertheless, you can spend a day to discover nearby China Beach and the Marble Mountains – with some nice caves and an incredible view (former military look-out) across the city and its surroundings (Da Nang has been a home to a majority of US soldiers during the Vietnam War who were stationed here). 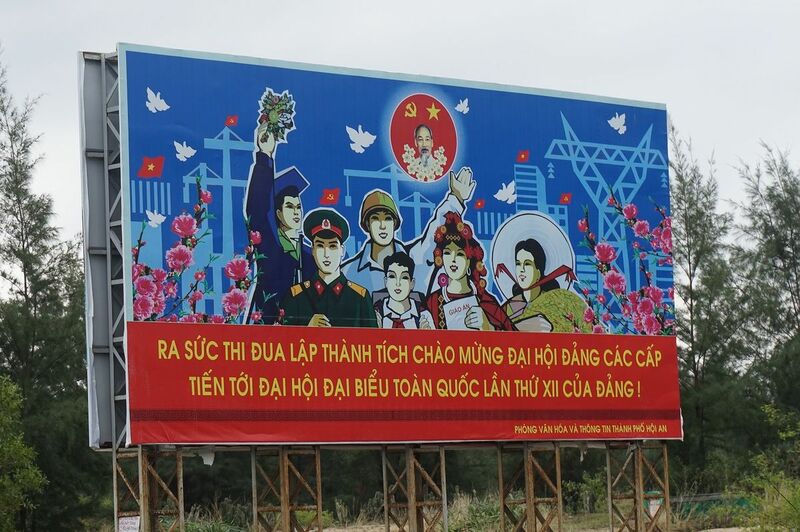 Truly a highlight when visiting central Vietnam and a place full of history, good food and rich in culture. The center of the city is the Perfume River and the old city with its ancient citadel. The town is connected with the imperial dynasty of the Nguyen lords. It also hosts a collection of tombs, pagodas and palaces and definitely is a great place to see for every first-time visitor to the country. Unfortunately we did not make it here but would highly recommend every traveler to drop by for at least 2 days. 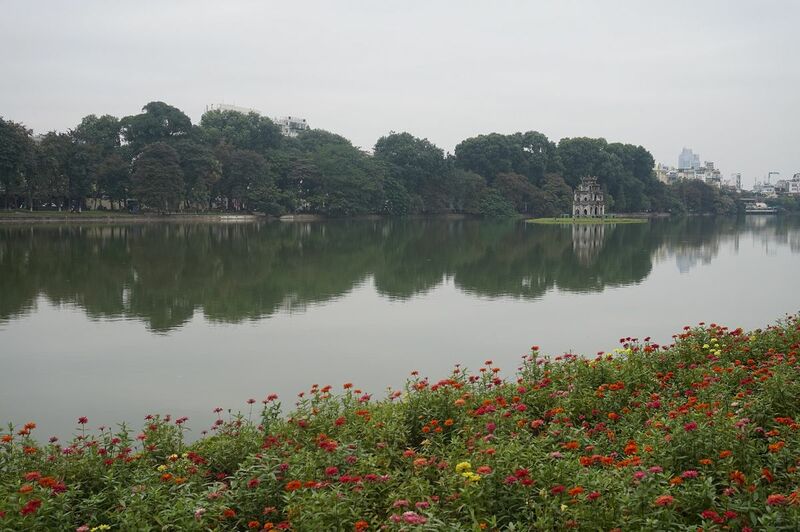 Hanoi can be used as a hub for discovering the surrounding places of Sapa and Ha Long Bay. The city is quite beautiful and not as chaotic, hectic and hot as Ho Chi Minh. The town has a certain charm with its nice mix of tradition and modern touch. The small side streets are filled with vendors selling foods and clothes and there are lots of interesting architectural sights to see. The heart of town is a small lake with a pagoda located on the middle. It is the center for lots of activities as many Hanoians gather around the lake to meet, drink, eat and do sports. 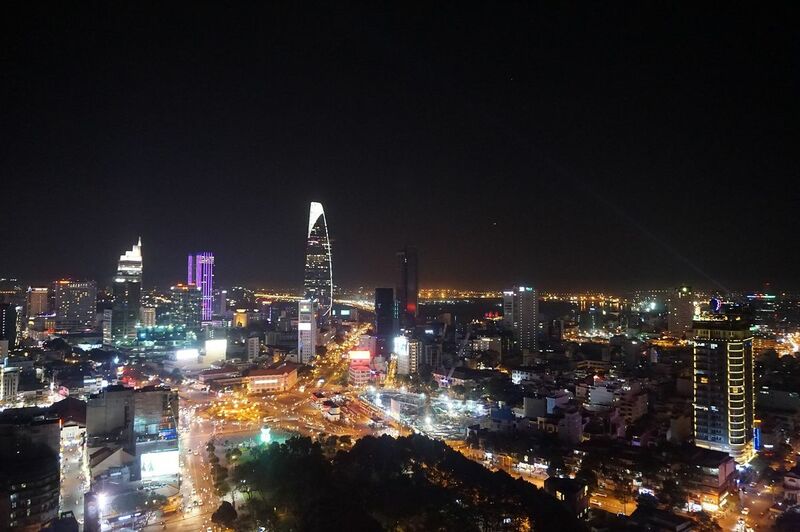 Taste some great Vietnamese Coffee in one of the many roof cafes and enjoy the views across the lake or simply watch how the people, cars and motorcycles wind their way through the streets from above. Burning fake money, also known as “ghost money” for deceased relatives. 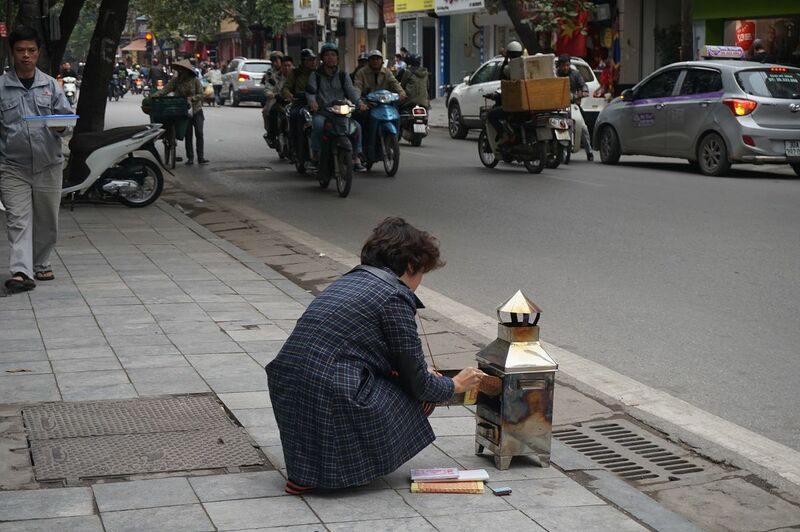 Just to make sure the spirits have a good time in their afterlife!A very common ritual across Vietnam. 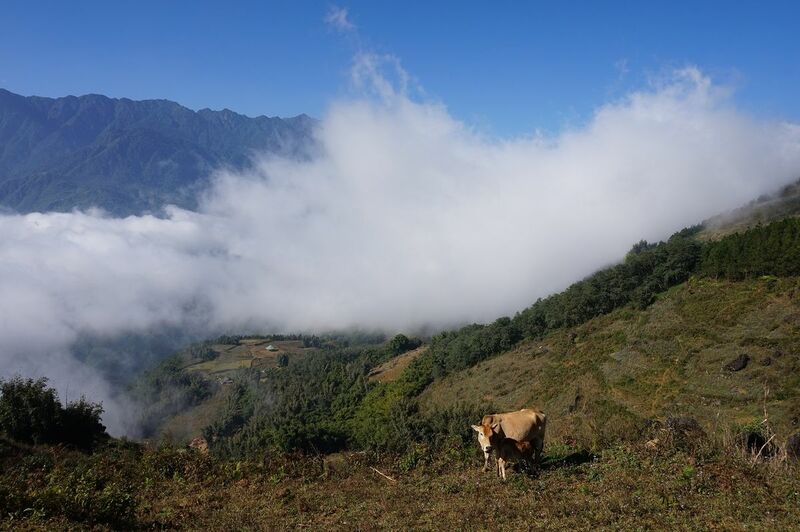 Sapa is quite a famous trekking area located high up north, almost bordering to China. We took a night bus to get there as it does take quite a bit to reach from Hanoi. 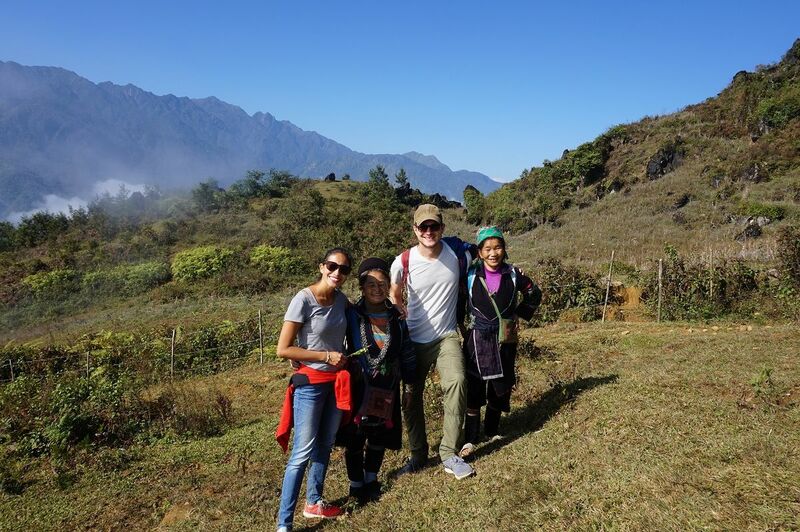 There are different kinds of trekking places around the mountains with Sapa being the most famous and also most tourist one. Nevertheless we had a great time and were also very fortunate as the weather played along and presented us with lots of sunshine. 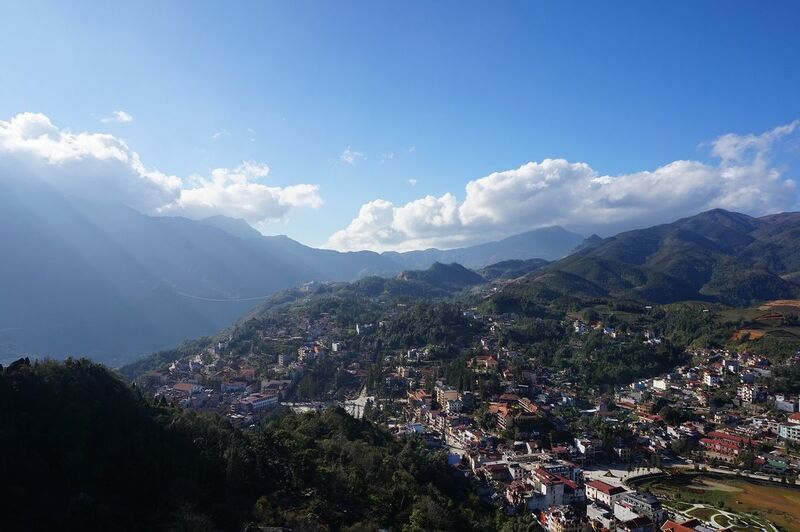 Have look at our separate blog post about Sapa for more information. 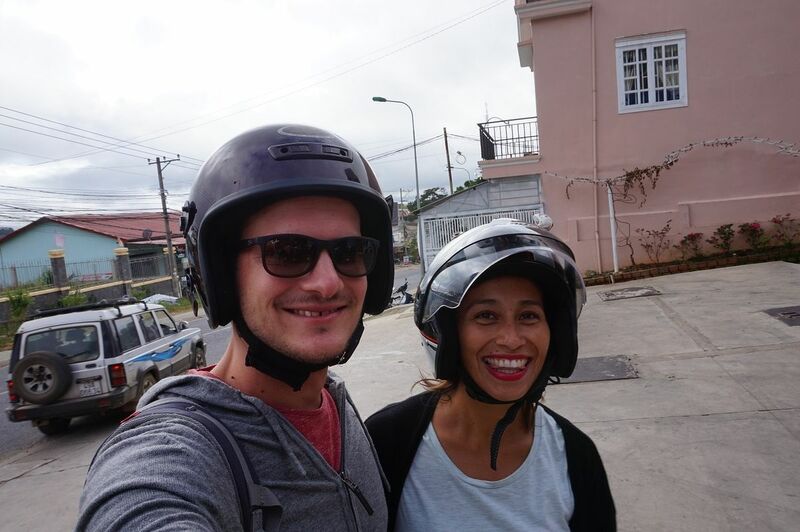 You can book your stay in Sapa with one of the many tour companies in Hanoi. 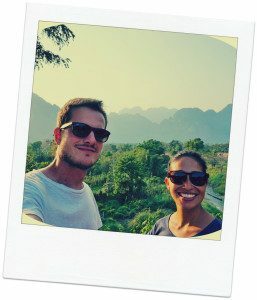 We chose to do the two-day trek and had a very nice time hiking through the highlands of Vietnam. The landscape was beautiful and the scenery was breathtaking. Although rather small, Sapa town itself is also quite nice. 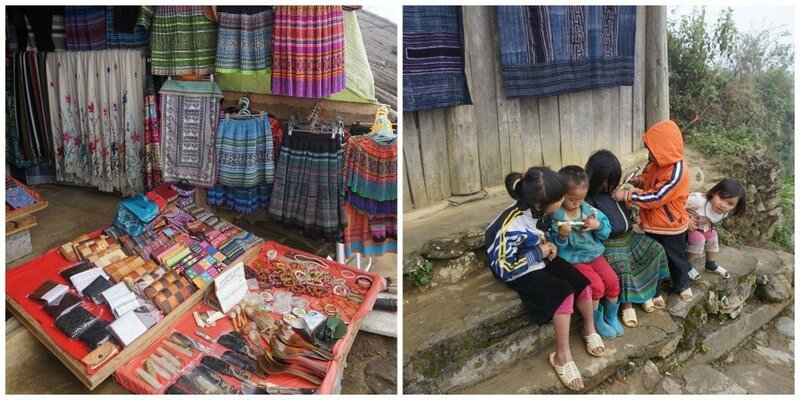 Here you can wander around the main road and discover the market and see many woman from the Hmong tribe selling clothes and various local fabrics. Also, you can climb the hill right close to town and find some amazing views of the surrounding mountains. Truly a nice place and highly recommendable to visit. 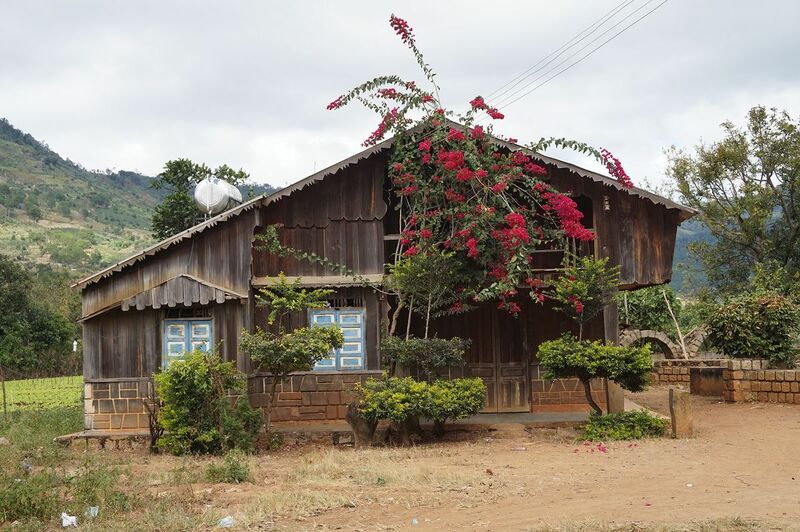 Make sure you book a night in a Homestay as this is a nice way to get in touch with some local families. Trekking view – it can be quite cloudy. 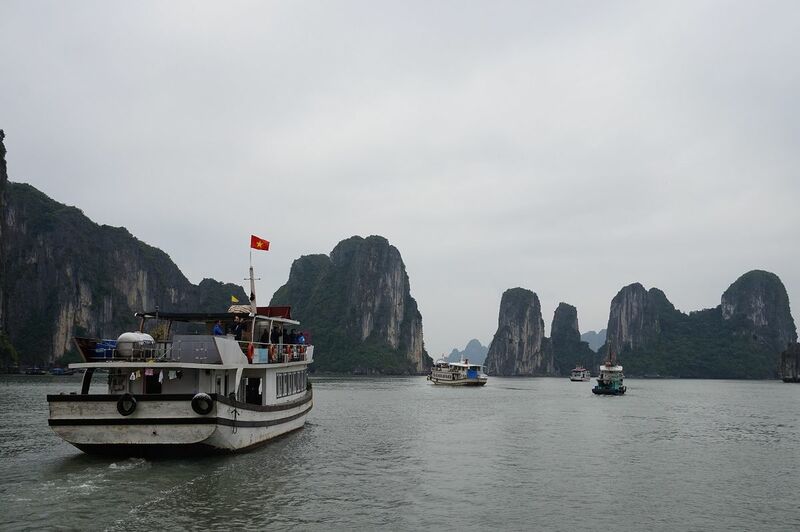 Ha Long Bay is probably THE highlight of anyone visiting Vietnam. It is a must-see destination when you are visiting the area and is quite an impressive sight. 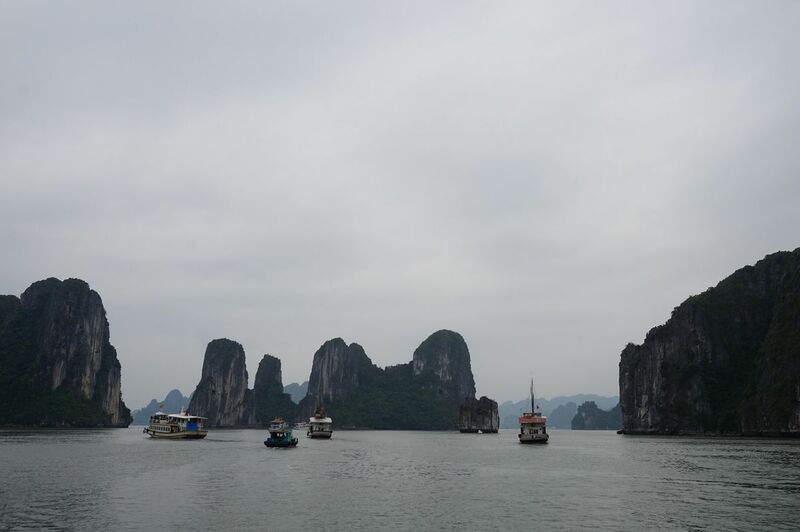 Unfortunately we had to squeeze Ha Long Bay in 1 day but I would strongly suggest to do it in 2 days. There are options of staying overnight in a smaller island and on one of the many boats that tour along the bay. The mountains and rock formations are very beautiful and unique. When taking a boat tour (I guess there really is no other way) you will eventually visit huge caves and stopover in places with nice views. Once again we were unfortunate to have bad weather the day we visited but I can imagine the nice views on clear days. Visiting the bay in one day, although a bit tight, is possible. You have time to cruise along the bay and enjoy the views of the mountains rising up from the water. You can have some lunch on the boats and even have time to go kayaking. 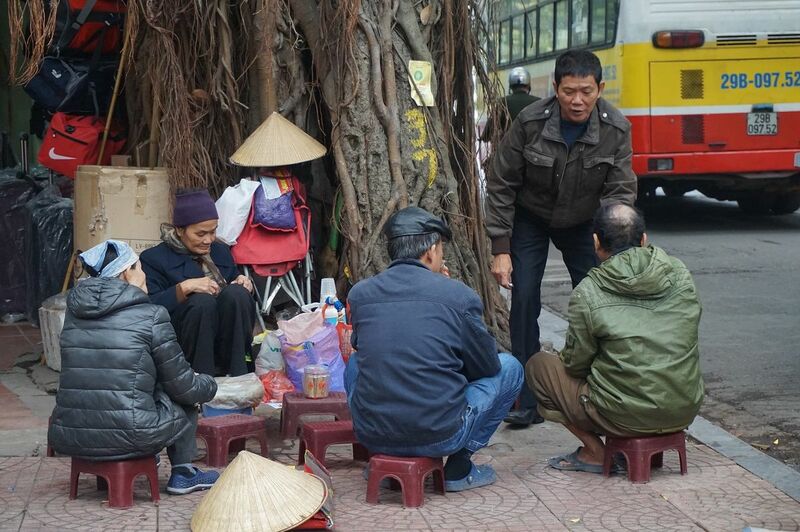 When is Hanoi this surely is a place to see before leaving the country. We had a very cloudy day – nevertheless the views were fantastic!